DL-Buthionine-(S, R)-sulfoximine (BSO), a glutathione-depleting agent, was found to diminish the nephrotoxic effect of cisplatin (cis-diamminedichloroplatinum). Pretreatment of rats with BSO (4 mmol/kg s. c.) 2 h prior to cisplatin, either as a single dose of 5 mg/kg or at a daily dose of 2.5 mg/kg for 3 consecutive days, resulted in diminished elevations of plasma BUN concentration and decreased cisplatin-induced inhibition of renal γ-glutamylcysteine synthetase and γ-glutamyl transpeptidase activity measured 6 days following treatment. Administration of BSO prior to cisplatin at 7.5 mg/kg did not significantly alter the effect of cisplatin on either BUN concentration or enzyme activity. 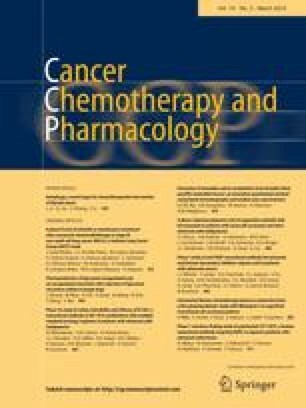 The influence of BSO pretreatment on the antitumor activity of cisplatin was studied using implantation of a murine bladder cancer (MBT-2) in C3H mice. Pretreatment of mice with BSO (5 mmol/kg) did not influence cisplatin antitumor efficacy.